Yesterday I offered you a painting by Piero di Cosimo and most of My Daily Art Display was taken up with the story behind the painting and the painting itself without touching on the life of the artist. Today, to make amends, I am giving you not just one painting by Cosimo but two portraitures ,but first, just a little about the artist himself. Piero di Cosimo, also known as Piero di Lorenzo was born in Florence in 1462. His father Lorenzo was a goldsmith. He was apprenticed to the artist Cosimo Rosseli, his godfather and a painter of the Quattrocento, which takes in the artistic styles and cultural events of the 15th century. It was from Rosseli that Piero di Lorenzo derived his more common name “Cosimo”. In 1481 Pope Sixtus summoned Rosseli to Rome where he was commissioned to decorate part of the Sistine Chapel. Rosseli took Cosimo with him and he helped Rosseli with the fresco of the Sermon on the Mount, painting the background landscape. In Rome Cosimo developed a love for the Renaissance painting genre completing many works appertaining to Greek Mythology, one of which was showcased yesterday in My Daily Art Display. He is best known for his idiosyncratic paintings featuring fanciful mythological inventions in a world inhabited by satyr, centaurs and primitive men. He was a superb painter of animals and a master of portraiture as one can see by today’s paintings. Cosimo was an eccentric. He was a solitary person, a loner, who preferred his own company. He didn’t like people to see him at work and would lock himself away for days on end. He was untidy and his studio rooms were dirty but he seemed oblivious to the chaotic circumstances of his life. He also had an irrational fear of fire and rarely cooked his food and he was terrified of thunderstorms. 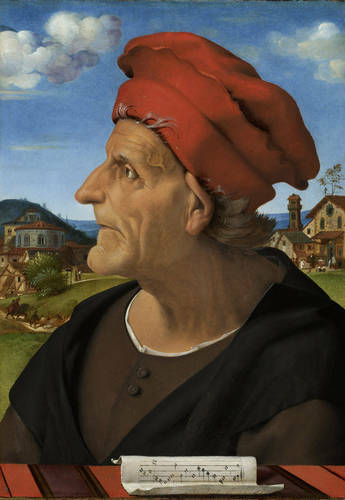 Piero di Cosimo died of the plague in 1522, aged sixty. My Daily Art Display today is paired portraits painted by Cosimo. Portraits featuring two people at that time were usually male and female and often man and wife. This set of paired portraits is a rare example of a portrait pair featuring two men, actually father and son, from different generations. They are the only surviving portraits, which have been irrefutably accepted as being the work of Cosimo. Both are wood panel paintings, one is entitled Portrait of Giuliano da San Gallo, Architect (the son) and the other is Francesco Giamberti San Gallo, Musician (the father), a cabinet maker, architect and musician in the service of Cosimo de Medici family. The name “San Gallo” was added later to the family name “Giamberti”. The name derived from the Porta San Gallo, one of the gates of the city of Florence, near which the Giamberti family had their house. Portrait of Giuliano da San Gallo, Architect by Cosimo was completed in 1482. This highly successful architect and master builder to Lorenzo de’ Medici, the Florentine ruler, stands at a balustrade, turned three-quarters towards the observer. On the balustrade are the tools of his architectural trade, namely a compass and a quill. In the background there is an undulating Tuscan landscape which abuts a mountain range. His appearance is formal and dignified. He looks self-confident and somewhat aloof. Note the detail reproduction of the cloth on the upper part of his sleeve. 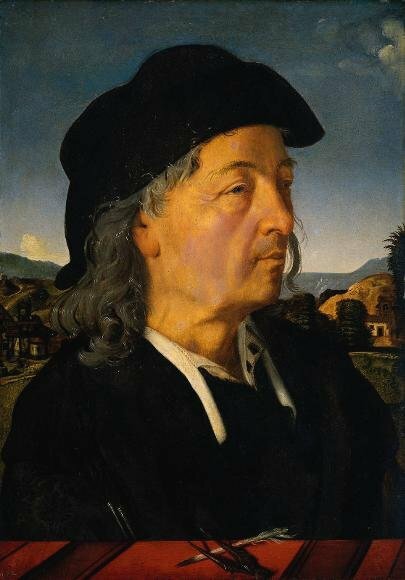 Note also the effort Cosimo has put in with regards his appearance, the wrinkles around the eyes and the silvery tints in his graying hair. Francesco Giamberti San Gallo, Musician belongs, like the other portrait, belongs to the Rijksmuseum in Amsterdam but has been loaned out to the National Gallery in London. The painting was completed circa 1482 and was commissioned by the son Giuliano on the death of his father in 1480, the intention being that it would form a portraiture pair with his own earlier portrait carried out by Cosimo. The father is painted in profile which gives a clear outline of the face offset against the background. This clear-cut portrait shows an old man with sunken cheeks. He is formally dressed which makes some art historians believe that the father had already died and the portrait was based on the death mask of the father. His face has signs of light gray stubble and we can see the veins on his temple and his ear lobe. His ear is almost bent double by the weight of his hat. As was the case in the son’s portrait the father is side on to a balustrade on which are the “tools of the father’s trade” – not the tools of a cabinet maker or architect but the “tools” of a musician – a sheet of music for Francesco Giamberti often composed music for the Medicis on special occasions. The two paintings are outstanding in the way the faces contrast sharply against the background landscape and sky. Note the silken cover on the balustrade of both portraits. Observe how the pattern of the striped silken fabric seems to run continuously through both portraits. It is thought that after Cosimo completed the portrait of the father, Francesco along with the tools of his trade he went back to the portrait of the son, Giuliano and added this ornamentation and his “tools of the trade” to his portrait in order to achieve a commonality between the two paintings . So why did Giuliano commission the painting of his father? Was it for him to remember him or is it as some art historians postulate that it was to enhance his own reputation by emphasising his own intellectual heritage and thus improving his own standing as an architect. Maybe that is an unjustified and a cynical view of the situation. You must decide ! Cephalus returned, and was as happy as ever in his wife and his woodland sports. Now it happened some angry deity had sent a ravenous fox to annoy the country; and the hunters turned out in great strength to capture it. Their efforts were all in vain; no dog could run it down; and at last they came to Cephalus to borrow his famous dog, whose name was Lelaps. No sooner was the dog let loose than he darted off, quicker than the eye could follow him. If they had not seen his footprints in the sand they would have thought he flew. Cephalus and others stood on a hill and saw the race. The fox tried every art; he ran in a circle and turned on his track, the dog close upon him, with open jaws, snapping at his heels, but biting only air. Cephalus was about to use his javelin when, suddenly he saw both dog and game stop instantly. The heavenly powers, who had given both, were not willing that either should conquer. In the very attitude of life and action they were turned to stone. So lifelike and natural did they look, you would have thought, as you looked at them, that one was going to bark, the other to leap forward. Cephalus, though he had lost his dog, still continued to take delight in the chase. He would go out at early morning, ranging the woods and hills unaccompanied by any one, needing no help, for his javelin was a sure weapon in all cases. Fatigued with hunting, when the sun got high he would seek a shady nook where a cool stream flowed, and, stretched on the grass, with his garments thrown aside, would enjoy the breeze. Sometimes he would say aloud, “Come, sweet breeze, come and fan my breast, come and allay the heat that burns me.” Someone passing by one day heard him talking in this way to the air, and foolishly believing that he was talking to some maiden, went and told the secret to Procris, Cephalus’s wife. Love is credulous. Procris, at the sudden shock, fainted away. Presently recovering, she said, “It cannot be true; I will not believe it unless I myself am a witness to it.” So she waited, with anxious heart, till the next morning, when Cephalus went to hunt as usual. Then she stole out after him and concealed herself in the place where the informer directed her. Cephalus came, as he was wont when tired with sport, and stretched himself on the green bank, saying, “Come, sweet breeze, come and fan me; you know how I love you! You make the groves and my solitary rambles delightful.” He was running on in this way when he heard, or thought he heard, a sound as of a sob in the bushes. Supposing it some wild animal, he threw his javelin at the spot. A cry from his beloved Procris told him that the weapon had too surely met its mark. He rushed to the place and found her bleeding and, with sinking strength, endeavouring to draw forth from the wound the javelin, her own gift. Cephalus raised her from the earth, strove to staunch the blood, and called her to revive and not to leave him miserable, to reproach himself with her death. She opened her feeble eyes and forced herself to utter these few words: “I implore you, if you have ever loved me, if I have ever deserved kindness at your hands, my husband, grant me this last request; do not marry that odious Breeze!” This disclosed the whole mystery: but alas! what advantage to disclose it now? She died; but her face wore a calm expression, and she looked pityingly and forgivingly on her husband when he made her understand the truth. Our featured artist today is the Italian Renaissance painter Piero di Cosimo and the work of art I am featuring is his panel painting based on the Ovid story of Procris and Cephalus and the subsequent 1486 play by Niccolò da Correggio. The title of his unsigned painting which he completed around 1495 has often changed. Since the nineteenth century it was known as Morte di Procri (The Death of Procris) but the National Gallery in London which is the home of the painting has rejected this title and since 1951 has catalogued it as either A Mythological Subject or A Satyr Mourning over a Nymph. Notwithstanding the uncertainty of the title this painting, it was to become one of Cosimo’s most successful and popular works. . It is a very long painting measuring 185cms in length and is only 65cms high which makes one believe that this could have been for the front of a cassone, a bridal chest, or as the subject of the painting is about love, maybe it was to hang in a bridal chamber. The painting shows a satyr mourning over the lifeless body of a young woman who has suffered wounds to her hand, wrist and throat. At her feet sits a sad and mournful dog with its head slightly bowed. 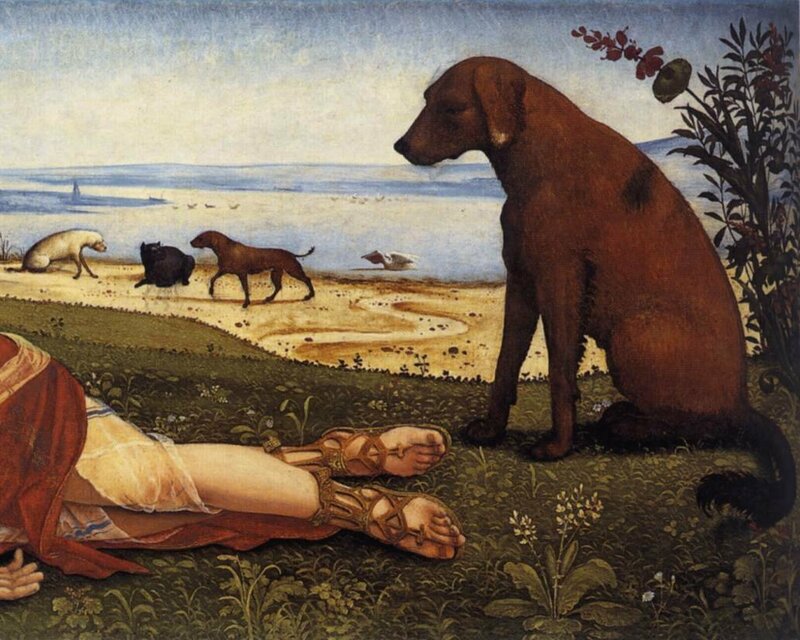 Maybe Cosimo intended the dog to be an image of Laelaps but of course in Ovid’s tale, he had been turned into stone by Zeus before the death of Procris. In the background one can see a river which could possibly represent one of the three rivers of the Underworld. At the water’s edge one can see other creatures – three more dogs and in the water a pelican can be seen with wings flapping. Art historians point out the many irregularities with Cosimo’s painting, if it was supposed to be a retelling of the Ovid tale, as in that, there was no satyr , albeit he appears as the fateful annoyance in Correggio’s play. It was the husband Cephalus that finds his dead wife and he is nowhere to be seen in the painting. Neither is the spear which killed Procris and the positioning of the wounds on her body do not coincide with what one would expect from a death by the spear’s penetration. Maybe this is just a lot of nit-picking and one should instead, concentrate on this amazing scene captured wonderfully by Cosimo. ﻿﻿﻿﻿Baron Antoine-Jean Gros, also known as Jean-Antoine Gros was born in Paris in 1771. His early artistic tuition, from the age of six, was carried out by his father and mother, who were both painters of miniatures. He soon proved himself to be a talented student and at the age of fourteen he went to work at the studio of the French Neoclassical painter, Jaques-Louis David, and at the same time carried on his art studies at the Collège des Quatre-Nations, also known as Collège Mazarin, after its founder Cardinal Mazarin. Gros admired David’s work and their artistic relationship blossomed and developed and Gros became one of David’s favourite pupils. Gros, after time, moved away from the strict purity of neo-classicism and developed a love for the more colourful works of Rubens and the great Venetian Masters. In 1791 his father died and Jean-Antoine was left to his own resources. In 1792, despite failing to win an award at the grand prix, he was recommended by the École des Beaux Arts to carry out some portraiture of members of the National Convention, the constitutional and legislative assembly, which at that time, ruled France. He became disillusioned with the way the country was being governed and a year later, in 1793, at the age of twenty two, left Paris and travelled to Italy. He lived first in Genoa where he eked out a living by painting and selling miniatures. It was whilst living in Genoa that he met Joséphine de Beauharnais, the wife of Napoleon Bonaparte, and through her met the great French leader himself. In 1796, Gros was with Napoleon’s army when the French managed to outflank the Austrian troops at the Battle of Arcole and he witnessed Bonaparte planting his beloved French tricolour on the bridge they had just captured. He encapsulated this incident on canvas, entitled Bonaparte at the pont d’Acole. Bonaparte was ecstatic at the way Gros had portrayed him at the scene of this great victory and immediately made him inspecteur aux revues, which permitted Gros to follow the army of Bonaparte and pictorially display future victories and, at the same time, select the artistic spoils of war which merited being taken back to the Louvre. His battlefield paintings were well received by Bonaparte. They were painted skilfully and with great flamboyance and style even if his portrayals strayed occasionally from the actual happenings. That notwithstanding, his art work was truly exceptional and he became one of the most honoured and respected French painters of that time. His work was sort out by the great and the good of the time and besides Bonaparte he carried out commissions for great rulers such as Louis XVIII and Charles X. After the defeat and exile of Napoleon the Bourbons Dynasty in the guise of Louis XVIII returned to rule France. Amongst the list of proscribed former revolutionaries who deposed Louis XVII during the French Revolution and who were to be executed was the artist Jaques-Louis David. For that reason David decided to flee France and go to Belgium. He refused to return to his homeland even though Louis XVIII offered him a full pardon. Jean-Antoine Gros took over David’s studio and endeavoured to work in a more Neoclassical style but his later work was never to receive the acclaim his Napoleonic paintings achieved. 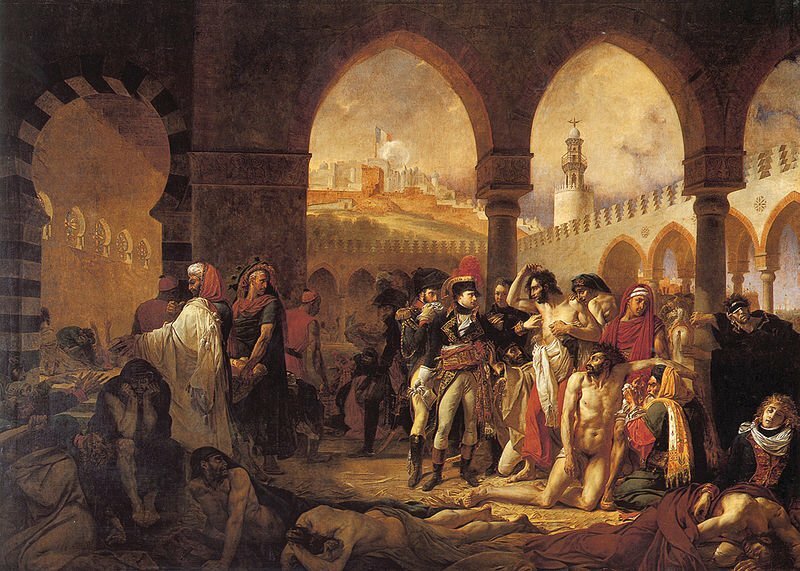 My Daily Art Display today is Jean-Antoine’s painting entitled Napoleon Visiting the Plague-Stricken at Jaffa which he completed in 1804 and can now be found in the Louvre. The painting was commissioned by Napoleon Bonaparte himself, who wanted Gros to paint a picture, pictorially recounting his visit to his sick troops at the military hospital, which had been temporarily set up in the courtyard of a mosque in Jaffa (now part of Tel Aviv, Israel). Napoleon’s bloody battle and the subsequent sack of the town of Jaffa occurred in 1799. Unfortunately for the victorious French army, their victory was closely followed by an outbreak of the bubonic plague, which was to kill far more French soldiers than died in the actual battle. In the background one can see the breached walls of Jaffa and an over-sized French tricolour fluttering in the wind. A pall of smoke from fires covers the whole area. In the left middle ground we see an Arab man handing out bread to the sick whilst his servant waits behind him holding the bread basket. Behind them we see two large black men carrying off, what is probably a dead body on a stretcher. 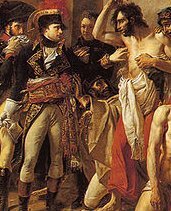 In front of Napoleon is a semi naked sick man being tended by an Arab physician. To the far right we can see a blind man grappling with the pillar as he tries to gain an audience with Bonaparte. Across the foreground we see bodies of the dying men prostrate on the ground. In the painting, Bonaparte was to be shown as a fearless man with no concern for his own health. Gros’s painting depicts Bonaparte as he confronted the pestilence during his visit to his men who had contracted the plague. Historians argue about the reasoning behind Bonaparte’s visit. Was he there to decide whether to abandon his dying troops in this hell-hole in Jaffa, as some historians would have us believe he discussed with his medical team the mercy-killing of his sick men or was his reason more noble and he was simply there to boost the morale of his sick men? Whatever the reason was for Napoleon’s to visit his troops, Gros managed to portray Napoleon in this painting as a brave and selfless man. Look carefully at the painting and see how Napoleon is depicted bravely touching the plague sore on one of his men (is this not similar to the biblical story of Jesus touching the leper?) Standing behind Bonaparte is one of his officers covering his mouth for fear of infection. Gros knew how to show Napoleon in a positive light and this contrast between Napoleon and his officer brought home to observers the courage of their leader. It was for the way Gros was able to manipulate a situation so as to show Bonaparte in the best light that Bonaparte favoured him over all his artistic contemporaries. This painting, the first Napoleonic masterpiece, was shown at the 1804 Salon de Paris around the time of Napoleon’s proclamation as emperor and his coronation and it received great acclaim and launched Gros’s career. Today my featured artist was considered to be the first American Romantic landscape painter. Washington Allston was born on the family plantation in Georgetown, South Carolina in 1779. His father, William Allston, was a captain in the army and who died shortly after the Battle of Cowpens in the American Revolutionary War when Washington was only two years of age. After his father’s death, his mother, Rachel re-married, this time to the son of a wealthy shipping merchant Doctor Henry Flag. Washington Allston graduated from Harvard in 1800 and for a short period settled down in Charleston, South Carolina. A year later he went to England and was accepted into the Royal Academy of Art in London. At that time Benjamin West, the Anglo-American painter was president of the Academy and Washington learnt much from the “Master”. He spent the next decade travelling around Europe visiting all the major art galleries and museums. He met and became great friends with the English Romantic poet Samuel Taylor Coleridge whose portrait he painted and now hangs in London’s National Portrait Gallery. In 1809, aged thirty, he married Ann Channing, the daughter of the great American Unitarian preacher William Ellery Channing. After further travels around Europe the couple settled down in London where his artistic career blossomed and he won many prizes for his paintings. Besides being a great artist, Washington Allston was an accomplished writer and many of his books were published. His first major work of art, which established him as a great artist was painted in 1814, entitled Dead Man Revived by Touching the Bones of the Prophet Elisha. Sadly, in 1815, after just six years of marriage, his wife Ann died. Her death devastated Washington and he beacme homesick for his country of birth. He moved back to America in 1818 and went to live in Cambridge, Massachusetts. He remained there for the rest of his life, dying in 1843 at the age of 63. He is buried in Harvard Square, in “the Old Burying Ground” between the First Parish Church and Christ Church. My Daily Art Display for today is a painting which Washington Allston completed in 1818 and which now hangs in the Museum of Fine Arts in Boston. It is entitled Elijah in the Desert. 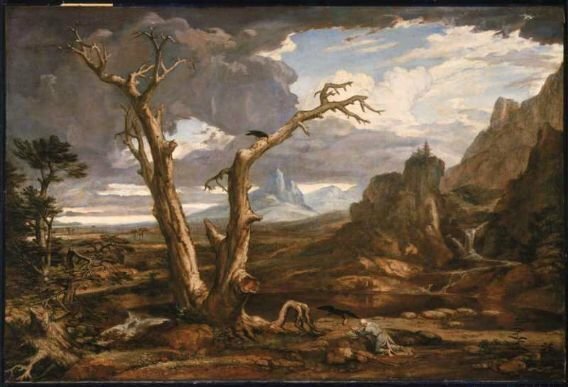 The subject of this painting comes from the Old Testament (1Kings 17:1-7) story in which God ordered the prophet Elijah into the desert and where he managed to stay alive with the help of the ravens who fed him with bread and meat. The painting vividly depicts the vast and unwelcoming landscape of the wilderness, using a sober palette of browns, grays and steely blues. The prophet Elijah, dressed in rags can be seen on his hands and knees pitifully crawling to reach a piece of meat the raven has just dropped on the ground in front of him. It is a poignant and distressing depiction. The size of the tiny figure of the prophet against this eerie setting adds to a sense of wretchedness and rejection and the observer experiences the tragedy of Elijah’s circumstances. “..We thought we couldn’t better testify our interest in this new art movement [American Romanticism] at home than by adding a really fine Allston to our public collection..”The donors went on to suggest that the museum, when completed, should be named after the artist but in the end it was simply known as the Museum of Fine Arts but a western suburb of Boston was named Allston.. This great American artist not only gained fame with his works of art but was a much heralded poet and author. His works were appreciated and loved by many including the great English novelist Charles Dickins, who called him “a fine specimen of old genius. Valentin Alexandrovich Serov was born in St Petersburg in 1865 and was to become one of the foremost portrait artists of his time. He was the only-child of Alexander, who was an operatic composer and mother Valentina, who was also a musical composer. He was brought up in a musical and artistic household. At the age of six his father died and his mother and he went to live in Munich and later Paris, which was then considered the centre of the Art world. It was here that once again Serov came into contact with the great Russian artist Ilya Repin who took over the art tutelage of Serov. He also studied art at the St Petersburg Academy of Arts. Serov was very interested in the Realism genre of art and was greatly influenced by what he saw in the major galleries and museums of his home country and those of Western Europe. On returning to Moscow from Paris, he and his mother were invited by Savva Mamontov to settle at Abramtsevo, an estate located north of Moscow, on the Vorya River. This estate had become a center for the Slavophile movement , an intellectual movement originating from 19th century that wanted the Russian Empire to be developed upon values and institutions derived from its early history. The property was originally owned by the Russian author Sergei Akaskov. On his death the property was purchased by the wealthy railroad tycoon and patron of the arts, Savva Mamontov. Through his efforts, Abramtsevo became a centre for Russian folk art and during the 1870’s and 1880’s the estate was to be home for many artists who tried to reignite the interest, through their paintings, in medieval Russian art. Workshops were set up on the estate and production of furniture, ceramics and silks, ablaze with traditional Russian imagery and themes, were produced. It was during his time here that Serov came into contact with the cream of Russia’s artistic and cultural talent. 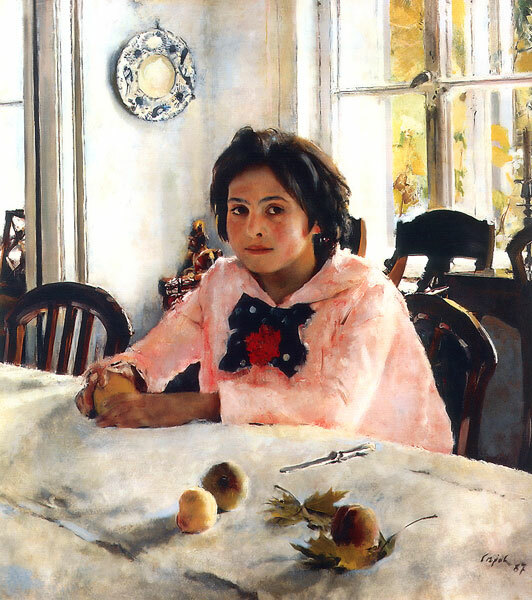 During his time at the Abramtsevo Colony, Valentin Serov met and painted the portrait of Vera Mamontov, the twelve year old daughter of Savva Mamontov and it is that portrait entitled, Girl with Peaches, which is My Daily Art Display painting for today. It is said that this painting launched Russian Impressionism. Serov exhibited this painting at the Academy of Fine Arts, St Petersburg and received great acclaim and it is now looked upon as one of his greatest works. The painting which hangs in the Tretyakov Gallery in Moscow is a more relaxed study and is breathtakingly beautiful. Serov pieces together fragments of the interior scene and still-life. The light pours in through the window and dissolves the contours of the objects. Serov uses warm tones for the girl which in some way contrasts with the colder tones of the space. The black eyes of the girl look out at us, thoughtful but slightly impatient. During the 1880’s Serov travelled abroad and came into contact with French Impressionism and the Impressionist painters such as Degas. Due to his family background and the popularity of his paintings, Serov never struggled financially. He was the foremost portraiture artist of his time and his subjects included the Czar. In 1887 he married Olga Trubnikova and their children featured in many of his portraits, such as the picture-portrait Children (1899), which show his sons Yury and Sasha. In 1905, on his fortieth birthday, he was elected as an academic of the St Petersburg Academy of Fine Arts. Sadly his life was cut short at the tender age of 46 when he died of a heart attack. The reason he never achieved the fame similar to a number of his Western European artistic contemporaries is probably because of where he lived and spent most of his life. My Daily Art Display for today starts off with a general knowledge question for you. What or who is a gleaner? The reason I ask is because that is the title of today’s painting by Jean-François Millet. Don’t know? I must be honest I thought by looking at the picture a gleaner was somebody who cut the corn crops but actually that is not the case. A gleaner is a person who collects left-over crops from farmer’s field after they have been harvested. It was traditionally part of the natural cycle of the agricultural calendar undertaken by the poor, and was regarded as a right to unwanted leftovers. Although the practice of agricultural gleaning has gradually died away due to a number of historical factors (including industrialisation and the organisation of social welfare for the poor), there are nonetheless still people in the present day that we might understand to be gleaners. Can you imagine what a back-breaking task this was for the poor and needy ? Actually modern day gleaning is practiced by humanitarian groups who collect food from supermarkets that would otherwise be thrown away, and distribute the gleaned food to the poor and hungry. If we look back in the Old Testament Bible we come across the tale of Ruth who was a gleaner but in the bible she is the personification of virtue and modesty but Millet’s gleaners are simply shown as women who, because of their desperate circumstances, are forced to act as gleaners to survive the hardships of life. Millet’s three women are show in the field, presumably having been given permission by the landowner, scavenging for “forgotten” ears of corn which the harvesters had failed to collect. We see them in the foreground, bent over double, scouring the ground before them for the elusive grains. Each woman is shown at various stages of their task. The woman furthest away is bending down to pick up the grain, the middle woman is picking up the grain and the nearest woman has just straightened up. The lone horse rider to the right, in the background, is probably the landowner’s overseer, who makes sure the harvesting operation runs smoothly and that the female gleaners only take what they are entitled to. He has distanced himself from the workers, which reminds us of the social distinction between management and worker. Millet, through the way he has depicted the scene has represented the class structure of a farming community. His three women embody an animal force deeply absorbed by a painstaking task. The contrast between wealth and poverty, power and helplessness, male and female spheres is forcefully rendered by the artist. The angled light from the sun illuminates the large haystacks and in some ways gives the three gleaners a kind of statuesque appearance highlighting their hands, shoulders and backs whilst enhancing the colours of their clothes and caps. 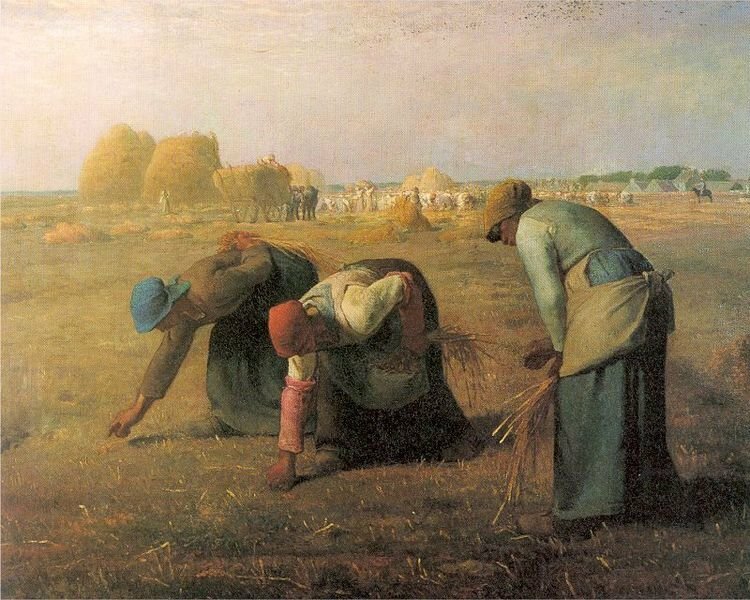 The Gleaners is an example of the Naturalism genre of painting. Naturalism is the representation of the world with a minimum of abstraction or stylistic distortion. It is characterised by convincing effects of light and surface texture and by the evocation of feelings and moods. It is an approach to art in which the artist tries to represent objects as they are actually observed rather than in a conceptual format. Have you a favourite painting you would like me to add to My Daily Art Display? If so let me know what it is and why you like it. After yesterdays disturbing painting I thought I would choose a more romantic offering for My Daily Art Display today. 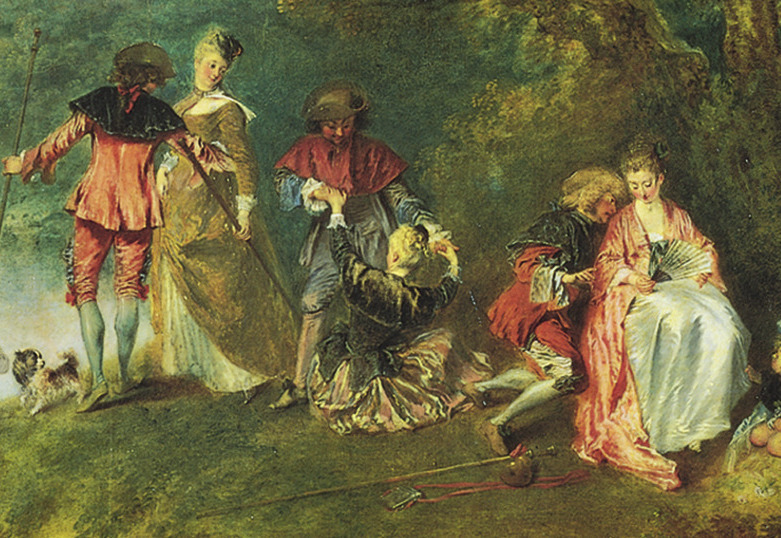 Antoine Watteau, born in Valenciennes in 1684, was the greatest French painter of his era. He was the second son of a well-to-do roof tiler and unlike the early life of so many artists I have studied, his parents encouraged his love of painting but at the age of 18, his family stopped paying for his artistic apprenticeship in his home town and he was allowed to move to Paris to further his artistic schooling and earn a living. He soon found work with local art dealers copying famous paintings. Whilst in Paris he met the stage-set and costume designer Claude Gillot who based his art work on themes from the Italian Commedia dell’arte, a form of theatre that began in Italy in the mid-16th century characterized by masked “types”, the advent of the actress and improvised performances based on sketches or scenarios. This type of theatre had been banned in France at the end of the seventeenth century when they had ridiculed King Louis XIV’s wife in a parody. On the king’s death in 1715, this kind of theatre came back into fashion. At the age of twenty five he won second place in the Royal Academy competition for the Prix de Rome. Around this time Watteau concentrated a lot of his art depicting military subjects and landscapes. In 1712, with his presentation piece, Les Jaloux (The Jealous), he became an associate member of the Academy. Watteau formed a friendship with the wealthy banker and art collector Pierre Crozat whom he stayed with, in his country estate in Montmorency. It was here that Watteau saw the banker’s magnificent collection of art works from some of the great Masters such as Titian and Veronese and the fêtes galantes themes of some of the paintings were to be an inspiration to the young Watteau. Fêtes galantes is a French term referring to some of the celebrated pursuits of the idle, rich aristocrats in the 18th century—from 1715 until the 1770s. After the death of Louis XIV in 1715, the aristocrats of the French court abandoned the grandeur of Versailles for the more intimate townhouses of Paris where, elegantly attired, they could play and flirt and put on scenes from the Italian commedia dell’arte. The term translates from French literally as “gallant party”. 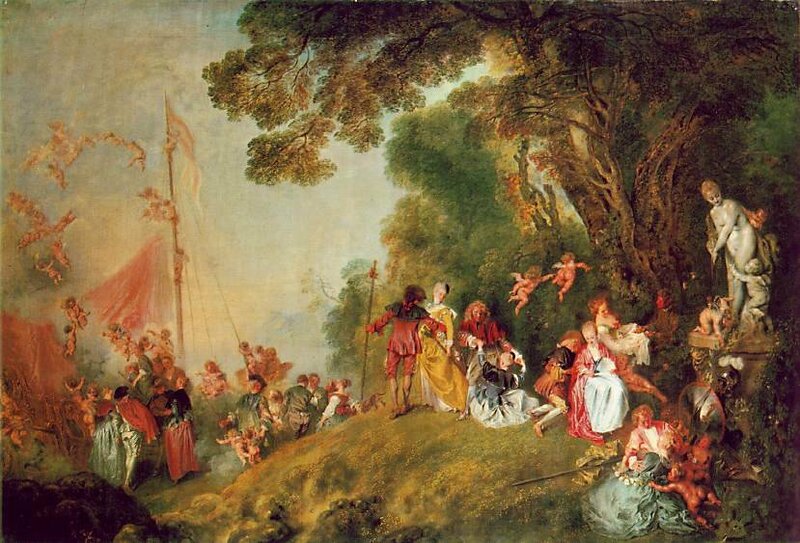 Watteau painted Musical Party which could well have been a depiction of his banker friend Crozat and his entourage enjoying themselves in the park at Montmorency. In 1717 at the age of thirty-three Watteau became a full member of the Academy with his diploma piece Pilgrimage leaving for the Island of Cythera, which is My Daily Art Display offering for today. The board of the Academy found it difficult to categorise the style of his painting and officially termed it as a fête galante and Watteau as a painter of fête galantes, which was to become an important new painting genre. This painting, an allegory of courtship and falling in love, now hangs in the Louvre. A later variant of it ican be found n Friedrich II’s collection at Schloss Charlottenburg, Berlin. In this latter painting, Watteau has added the masts of the boat and a statue of the goddess of Venus in the right foreground. Cythera, now known as Kithira, is a mountainous island off the Peloponnesus and was said to be the birthplace of Aphrodite, the Greek goddess of love, who was also known as Cytherea (Lady of Cythera) and is the location of her cult and shrine. People who made a pilgrimage to the “island of love” did so filled with eager anticipation. 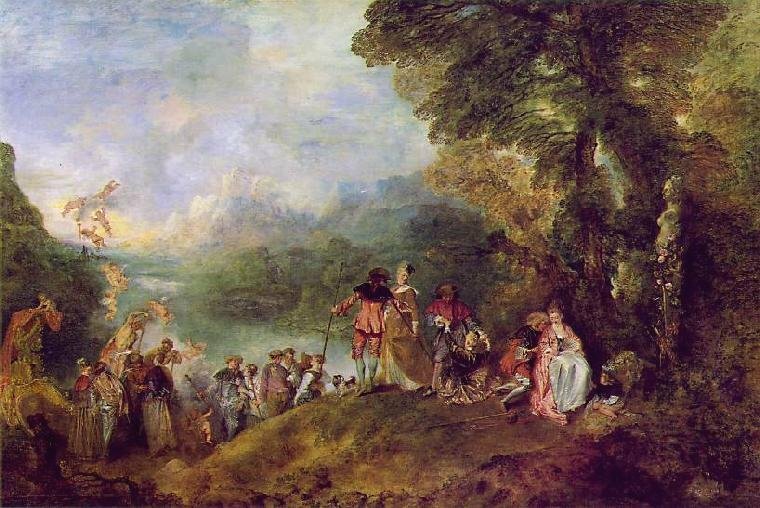 Watteau’s island is an island of love and his brightly coloured landscape add to the enchantment of the scene. 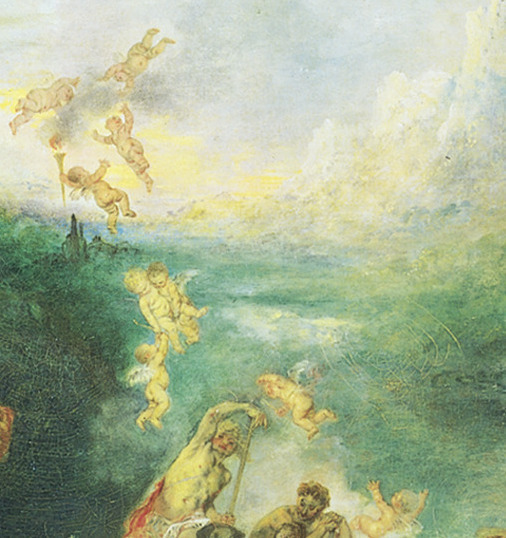 Cupids can be seen flying over the boat. In the painting the scene is set in which lovers are shown on a luscious and densely vegetated island. It is a dreamy vision. Couples are dressed in their silken finery, which we can almost hear rustling as they move about. One couple is seated and seems to be unaware of their friend’s departure, completely engrossed in what was probably a flirtatious conversation. If we look at the couple in the middle we can see that the gentleman is helping the lady to stand whilst the man from the couple on the left has his arm around his lover’s waist urging her forward as she looks back at her friends, maybe encouraging them to hasten. There is some debate amongst art historians as to whether the title of the painting has the word “for” in it. In other words are the people we see in the pictures “leaving for Cythera” or “leaving Cythera”. The majority favour their leaving of the island of love. The answer must lie in the people depicted in the painting and their expressions. Are they full of joyful anticipation at heading for the island or somewhat despondent at leaving this paradise of love and happiness? The question still remains, so I will leave you to look and see what you think.